Brooklyn's first park may be getting a new entrance that some say would open up the green space to the neighborhood. 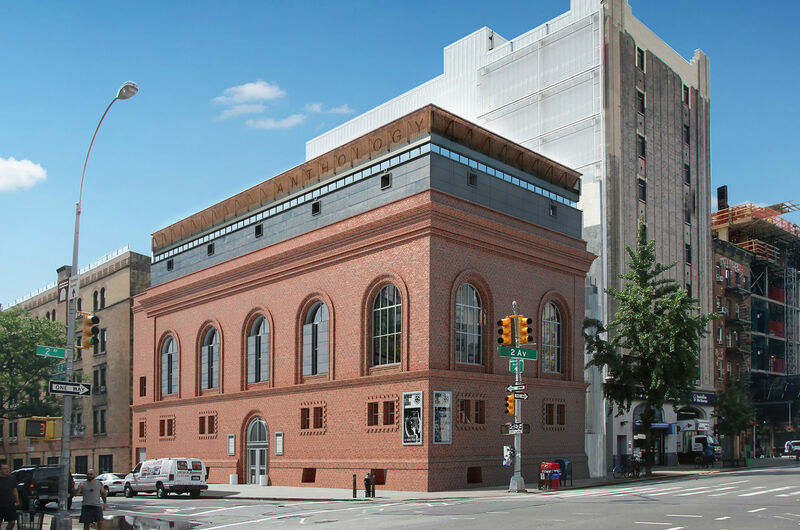 But opponents contend that the renovation would erase significant historic fabric, including a rare public commission by the late modern landscape architect Arthur Edwin (A.E.) Bye, Jr. In light of divided public testimony, the New York City Landmarks Preservation Commission (LPC) postponed a vote last week on a Parks Department plan to redesign a main entrance at Brooklyn’s Fort Greene Park. The renovation would eliminate one of the few public works by the eminent 20th-century landscape architect, following a trend in New York City park design that opens park edges to the streets. The agency's proposal has been gaining momentum since earlier this year, but those who came to speak at the September 19 hearing cleaved on whether Bye's landscape should be demolished to make way for the new entrance. According to the Parks Department, the proposed changes would align with an unrealized design by McKim, Mead & White. For those who don't know, Fort Greene Park is a beloved 30-acre expanse in the northern corner of Fort Greene, a gentrified neighborhood near downtown Brooklyn. On a recent late summer day, children jumped around on play fortresses in the Revolutionary War–inspired playground, installed in the 1990s, while joggers cut paths around the hill to the Prison Ship Martyrs' Monument, McKim, Mead & White's towering memorial to the thousands of people who died aboard British ships in New York during the Revolutionary War (the remains are interred in a crypt below the structure). But the firm wasn't the first notable architect to work on the park. The area, once the site of a military fort from which the neighborhood takes its name, has been in use as a recreation space since 1848. But the state waited around 20 years after its founding to bring on Frederick Law Olmsted and Calvert Vaux to convert the decommissioned fort into a proper city park. As in Central Park and nearby Prospect Park (which both opened more than two decades after Fort Greene Park), the duo cut closely-planted, wending walkways through a rural landscape, with paths offering views of great grassy lawns. The designers planned a main entrance at the northwest corner that opened onto an open space for public gatherings. Since then, amid minor tweaks and changes, the park has undergone three partial redesigns by leading landscape architects. Though unmistakably of their eras, all of these redesigns pay homage to Olmsted and Vaux's original design and reveal the layered histories that characterize New York City parks of this vintage. McKim, Mead & White led the first major revamp in the early 1900s, adding formal and classical elements to the park. The firm re-imagined the lead-up to the crypt with a palatial set of granite stairs cut into the hillside that allowed access to the crypt and the monument, cutting an axis through Olmsted and Vaux's gathering meadow. More than a century later, Robert Moses's landscape architect, Gilmore D. Clarke, together with his partner Michael Rapuano, applied their experience designing parkways in Westchester County, New York, to the landscape. The pair regraded the terrain, replaced winding paths with straight promenades, and erected a stone wall around the park perimeter while programming more space for recreation. Their 1930s interventions strengthened the McKim, Mead & White axis. Around 40 years after that, in the early 1970s, A.E. Bye built upon the work of his predecessors with a characteristically spare series of mounds that lead up to the steps of the monument at the top of the park's highest hill. Though it's not as obviously modern as a Dan Kiley or a Lawrence Halprin landscape, Bye's work near Fort Greene Park's northwest edge is undoubtedly modernist in its approach and execution—his design vocabulary of cobblestones, grass, and urban street trees drew on existing plant life and the city's natural systems. It's also the latest work of modern landscape architecture in New York City to be threatened with removal. Now, the Parks Department is planning to replace Bye's and part of his predecessors' work with a new, more open entrance as part of Parks Without Borders, the agency's initiative to rethink the edge conditions of New York City greenswards. The plan started in May 2016 with a $10.5 million grant from Parks Without Borders, with around $7 million of those funds going to the contested entrance redesign. That initiative, spearheaded by Parks Department Commissioner Mitchell Silver, gives grants for improvements to parks selected by area residents. The money goes towards revamping entrances and park-adjacent spaces by taking down fencing that some see as imposing, or adding plantings to visually (and some say, symbolically) open up parks to the public they serve. The Fort Greene Park Conservancy, the nonprofit that stewards the park, successfully applied for a grant to re-do the northwest entrance. The current proposal would eliminate part of Clarke's wall and all of Bye's landscape. The Parks Without Borders project area is almost four acres, and plans call for replacing the mounds with flat paving flanked by an allée to soften the space. 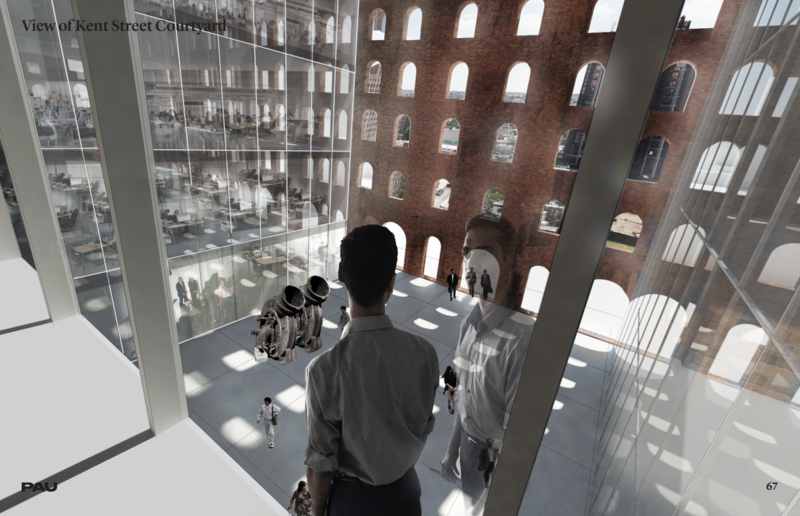 In the schematic drawing, the entrance facing the monument is 45 feet wide, as opposed to the original concept drawings, which depicted a 75-foot-wide entrance. A circular paved space in the park would be updated with a water feature surrounded by plantings and benches. The redesign would add two ten-foot-wide ADA-compliant ramps on St. Edwards Street and Myrtle Avenue—illustrated by a Drake meme in the renderings. Bye is best known for his minimal, sculptural landscapes, found mostly on the gated estates of the East Coast elite and suburban corporate campuses. He designed gardens for George Soros' homes in New York and Connecticut, as well as for Leonard and Evelyn Lauder. 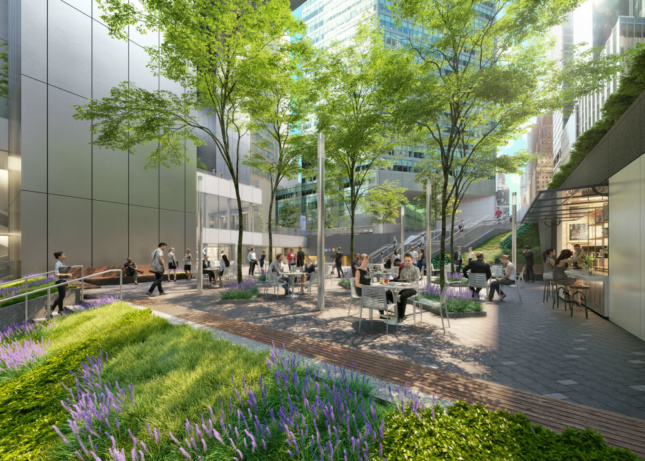 Bye didn’t do as much urban work, but in New York, his early work could be seen at the Water Street POPS, a privately-owned but publicly accessible plaza at 77 Water Street with stylized geometric stream wending towards the East River. Archival plans for Bye’s designs are co-credited to Berman, Roberts & Scofidio, Ricardo Scofidio's firm before he and Elizabeth Diller founded what is now DS+R. “Ed wasn’t much of a drawer,” Scofidio said, referring to Bye by his nickname. He didn't design in plan. Instead, Bye used self-designed stamps of trees to create planting schemes, or he worked on-site, moving earth to realize his designs. This hands-on approach didn’t mesh with the city bureaucracy, Scofidio said, so his firm at the time did drawings for city approval that showed how Bye would remove concrete paving, add 16 trees to the plaza, and install a lawn surrounded by earthen mounds. Pictures from the 1970s show the mounds edged by concrete and wood benches that faced outward from their anchors. Scofidio noted that his other partners were more involved in Fort Greene Park than he was. Attempts to contact John Roberts, the firm's other surviving member, were unsuccessful. It's likely, though, that Bye's mounds in Fort Greene were developed under a Parks Department program championed by former mayor John Lindsay that hired noted landscape architects to inject new life into aging city parks. To learn more about Bye and his public work, The Architect's Newspaper (AN) reached out to Thaisa Way, an urban landscape historian at the University of Washington, Seattle and the author of a forthcoming book on Bye. “Normally the work he does in natural materials like soil is done here in stone,” Way said. 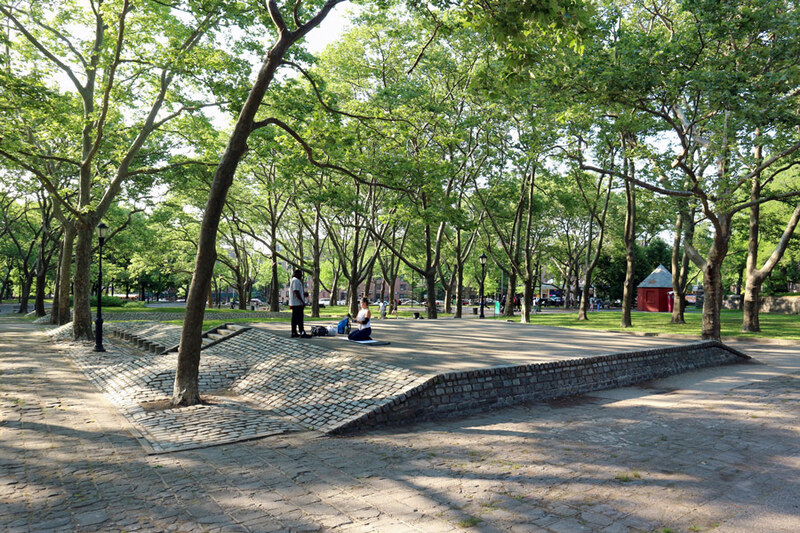 She strongly disputed the Parks Department’s assertion that Bye’s mounds are incongruous with Fort Greene Park's overall appearance—his practice was tied too closely to architecture to ignore the work of designers who came before him. Though Bye was offered teaching positions at prestigious landscape architecture schools, he preferred to teach architects. 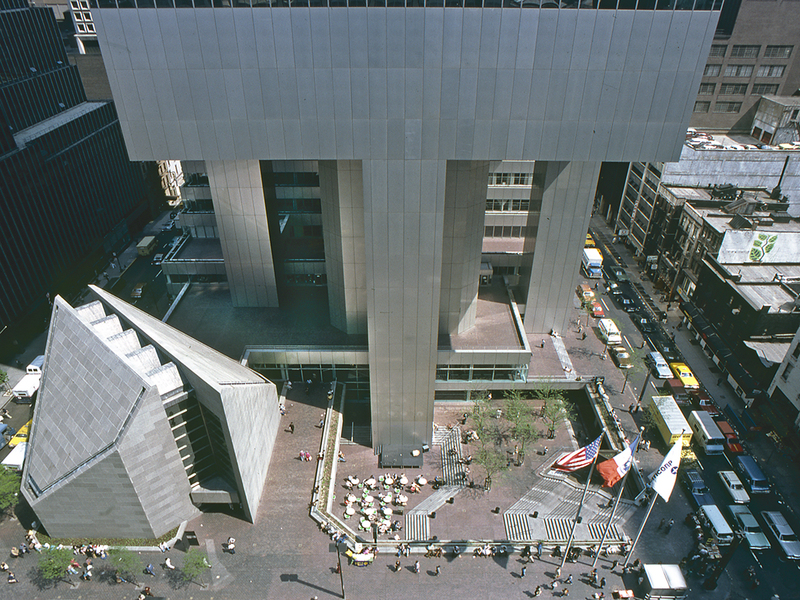 Way pointed out that for almost a decade, Bye taught at Cooper Union under then-Dean John Hejduk, whose design of Wall House 2 (also known as the A.E. Bye House) bears Bye's influence, since it was the only design by the paper architect that featured a site. From 1951 through the mid-1960s, pretty much every architect-in-training at Cooper—including Scofidio, a former student and later colleague—took a course with Bye, and for years afterward Bye co-taught site-planning courses for architects at the school. Moreover, before he started teaching, Bye worked briefly for Clarke and Rapuano, a relationship that suggests he was familiar with the firm's approach to public projects. On any nice day at Fort Greene Park, there are people lounging on Bye's mounds, stretching after a run up the steps, or lying down, staring up at the trees. The mini-landscape is a raised stage for dance performances, a subtle modern lead-up to McKim, Mead & White's rigidly formal classical monument. In spite of this, the Parks Department wants to remove all of Bye’s work, citing accessibility concerns. The mounds are lined with uneven cobblestones, and their grade is too steep for wheelchair users and others with mobility impairments to access. The agency’s preliminary renderings show a grand entry at the corner of Myrtle Avenue and St. Edwards Street that replaces the mounds with a flat plaza, pictured above. The project's website states that the design phase is 30 percent complete, and construction is expected to begin between spring and fall of 2019. (The rebuild will be done in phases to keep the Myrtle Avenue entrance open throughout construction.) In July, at a meeting of Brooklyn Community Board 2 (CB2), residents came out in force against the proposed changes, but at a meeting two weeks ago, Brooklyn Paper reported that CB2 voted unanimously in favor of the Parks Department plan, with one abstention and one recusal. In order to advance, the redo needs a green light from the community board and Landmarks (the park was designated as part of the Fort Greene Historic District in 1978). Curiously, the designation report doesn't mention any design updates past the early 20th century, so Clarke's substantial work goes unmentioned. Bye's work, completed seven years before designation, isn't mentioned at all. Now that the landscape is over 40 years old, a decade past the lower cutoff for landmarks consideration, there is growing concern that modernist landscape design is disappearing from New York City parks and public spaces. What is the motivation, then, for dramatically altering a park that some say is working just fine? The park is a thick dividing line between wealthy and poor Fort Greene. The entrance in question, on Myrtle Avenue, faces a superblock of public housing complexes; its mostly black and Latino residents frequent the park's north side. Although there new luxury apartments popping up around the Myrtle Avenue corridor, that side of the park closes at 9 p.m., while the southern border at DeKalb Avenue, which faces a stately row of brownstones, closes at 1 a.m. In 2000, there were almost 35,000 black residents of Fort Greene, or 65 percent of the population. The 2010 census found that black people now make up only 47 percent of the population, while the white population spiked from 18 to 36 percent of the neighborhood. The 18 percent decrease in the black population is 4.5 times greater than the borough average, and nine times greater than the city as a whole. Despite real estate pressures and divergent opinions over the importance of Bye's design, stakeholders do agree that the park is in need of ADA-compliant upgrades, like handrails and curb cuts, new lighting, enhanced active recreation areas, including a new basketball court, as well as some T.L.C. for cracked walkways and lawns eroded by overuse. To prepare for the revamp, the Parks Department held a design visioning session in February 2017 at the Ingersoll Houses, one of the public housing complexes across from the park. At that meeting, The Brooklyn Paper reports, the agency presented two plans (one had more trees) and some residents expressed concern that the plans were too similar, leading them to believe the design was "fait accompli." At that same meeting, the paper reported that Parks believed that keeping A.E. Bye's mounds for preservation's sake was ill-advised, as the work doesn't match Olmsted and Vaux's vision. The Parks Department said it didn't know why Bye added his mounds. At last week's Landmarks meeting, though, the commissioners’ discussion focused on the historic issues that the LPC is supposed to weigh in on and deferred any discussion of more urbanistic concerns, such as whether the proposal included enough green space. In addition to representatives from three nonprofits and one landscape architect who specializes in modern landscape preservation, six community members came out to testify against the plan, and four, including one CB2 member and two individuals from the Fort Greene Park Conservancy came out in support of modifying Bye's work. Opinions on the mounds contrasted sharply. 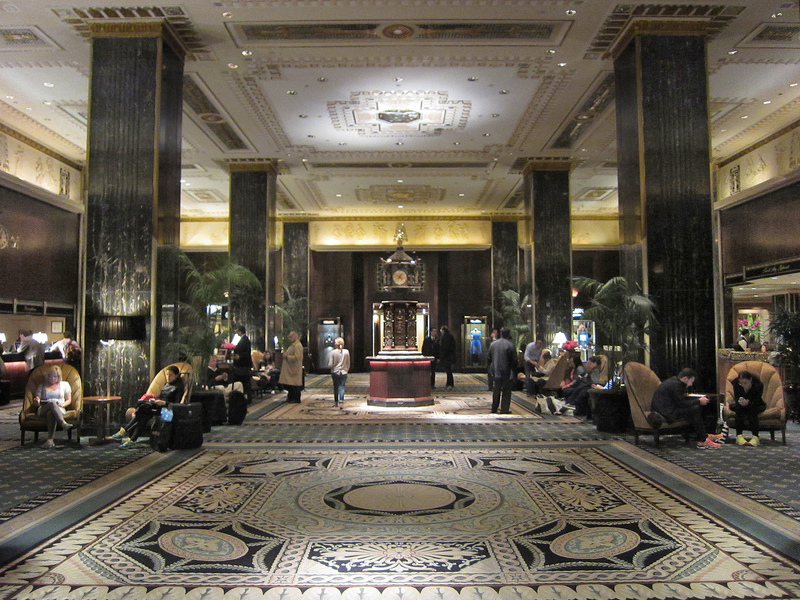 Testimony from urbanists at the City Club of New York, preservation advocacy groups Historic Districts Council (HDC), and Society for the Architecture of the City implied that Parks had cherry-picked historical examples to support its design vision. Christabel Gough, secretary of the Society for the Architecture of the City, suggested the open, monumental Parks Department renders are “more reminiscent of Mussolini’s Rome than Olmsted," while Patrick Waldo of HDC critiqued the Parks Department plan for gesturing to a never-realized McKim, Mead & White scheme instead of actual history. 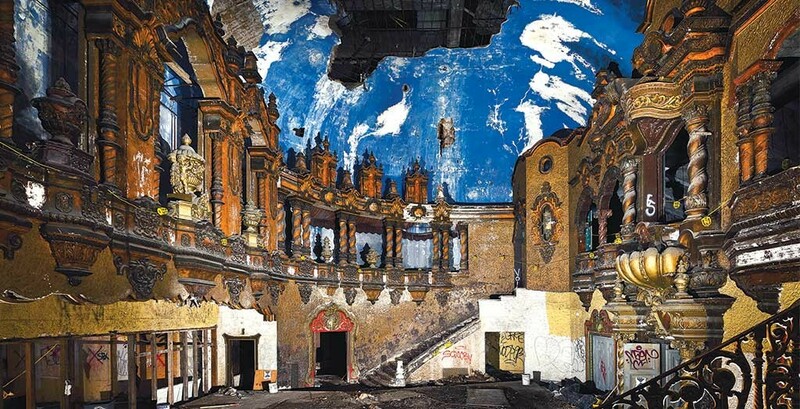 Waldo argued that returning sites to some halcyon “original” was contrary to the intent of contemporary preservation practice. Echoing Gotkin’s testimony, Commissioner Adi Shamir-Baron said entering the park from the corner was “antithetical” to previous design approaches, but Chair Meenakshi Srinivasan didn’t quite agree. The commission "doesn't have to reject something because it wasn’t historically here,” she said. “This is one of the most interesting and difficult decisions I’ve ever had to make,” said Commissioner Frederick Bland. In light of the conflicting testimony, especially around Bye's work, the commission decided to hold off on a vote. An LPC spokesperson said that once the commission receives a revised design from the Parks Department, it will schedule the item for another public hearing. The Landmarks Preservation Commission (LPC) this week approved a Parks Department plan to renovate a historic park, but proposed replacement of tall art moderne fencing with a shorter new fence—in keeping with an initiative to make parks more welcoming—was vigorously debated by commissioners and members of the public. At Tuesday's hearing, the Parks Department presented an expansive proposal to spruce up Jackie Robinson Park in West Harlem. The 13-acre greensward, once called Colonial Park, hugs Bradhurst and Edgecombe avenues between West 145th Street and West 153rd streets. Its rolling hills host a swimming pool and bathhouse at its southern end, one of the city's 11 WPA-era pool complexes and the only one built in a minority neighborhood. Designed by Aymar Embury II and Henry Ahrens, architects who worked under then-Parks Commissioner Robert Moses, the Jackie Robinson Play Center, built between 1935 and 1937, is art moderne through-and-through, with its simple brick massing anticipating the work of Louis Kahn. The pool and park perimeter are encircled by fencing; the most distinctive barriers are thin steel posts set between brick piers that match the bathhouse facade. The Parks Department would like to replace those landmarked fences with shorter ones, in keeping with Parks Without Borders, a new program to make parks more open and visually appealing. That program launched in 2015 with eight parks in the five boroughs selected for improvement the following year: Communities nominated parks for facelifts that could include lowering tall perimeter fences or removing them entirely, opening up narrow entrances, and building curb appeal in park-adjacent spaces. 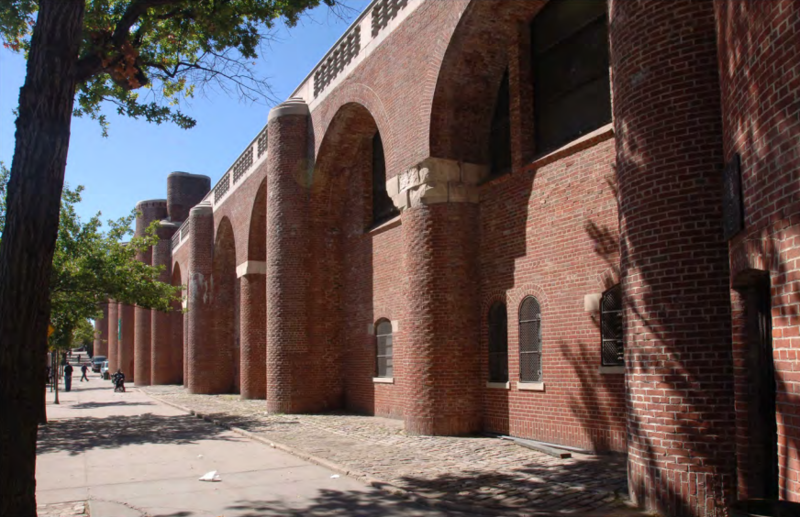 At various points in her presentation to Landmarks, a Parks Department representative called the entrances "unwelcoming" and referred to the fences as "giant," "heavy," "fortress-like," and "harsh," but acknowledged that the piers' brickwork matches the bathhouse. The Parks Department wants to remove the eight-foot-high perimeter fence at the southern border, which is bent and broken in places, and replace it with a four-foot-high barrier whose decorative elements borrow from fences elsewhere in the park of an earlier vintage. The agency also raised the possibility, based on its own research, that the southern fences were added at a later date (though the LPC designation report ties their to the construction of the pool and bathhouse). This project would come out of the almost $5 million in capital funds the city has allocated to carry out planned repairs, but that funding is not yet secured. Manhattan Community Board 1o reviewed the plans and supports the proposed changes. The fences were the subject of intense debate at the hearing, with members of the public and some commissioners voicing concern that the proposed fencing just doesn't harmonize with the surroundings. 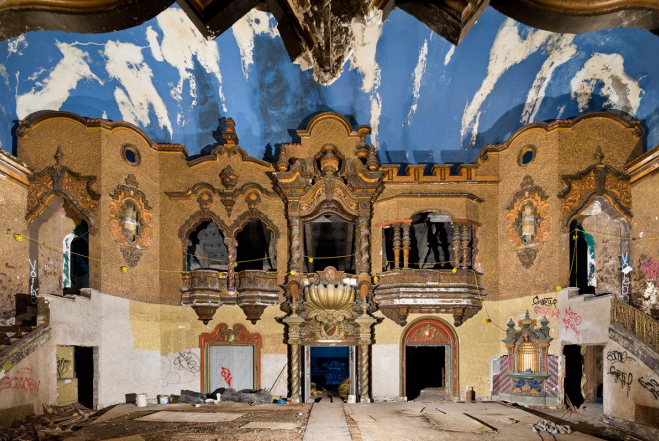 "This would be like replacing moderne windows with Victorian windows in an art deco building," said Patrick Waldo, reading a statement from preservation group Historic Districts Council (HDC). Reducing the height of the piers without reducing their width, HDC argued, would look strange and not dialogue appropriately with the monumentality of the pool complex. The group's statement noted that the wrought iron fence, which borrows from another park fence of a different era, is "stylistically inappropriate," adding that the complex is akin to a total development like Rockefeller Center; changing the details by stretching or shrinking them would compromise the overall design. In his testimony, landscape architect and preservation consultant Michael Gotkin called the fence replacement an "empty gesture." Gotkin, a longtime resident of the Upper West Side and West Harlem, believes that instead of the Parks Department addressing issues like inequality and disinvestment that prevent access to parks, the fences are being lowered for symbolic reasons. 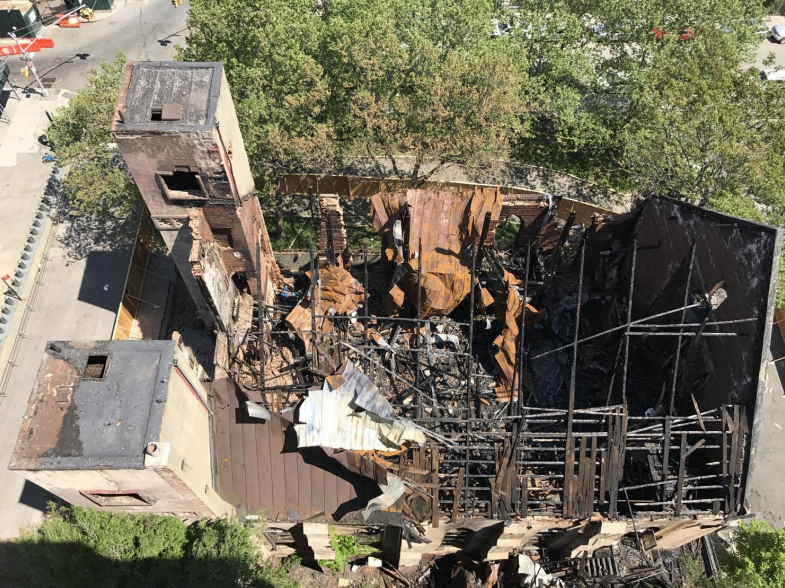 By the same logic, his testimony doubted whether the agency would lower Central Park's imposing Vanderbilt Gate or the tall wrought iron fence around the East Village's Stuyvesant Square. "We deserve as much preservation as rich neighborhoods," he said. After the hearing, historian and Harlem resident Michael Henry Adams highlighted a subtext to the planned changes in a historically black and rapidly gentrifying neighborhood where the median annual income hovers around $36,000. "It's just nutty to be talking about these airy-fairy things of making the park more welcoming for affluent white people when to do that, you are diminishing and altering an individual landmark. I think that's wrong." Adams has chronicled Harlem in two books and to works to preserve its history with Save Harlem Now!, a group he co-founded. The Landmarks commissioners, too, had conflicting perspectives on the fence replacement plan. Like every other commissioner, Adi Shamir-Baron favored the removal of chain link fences but called the removal of the larger piers a "strange thing to do." Formally, they dialogue with the monumentality of the building, but for her raised larger questions about their contemporary perception. 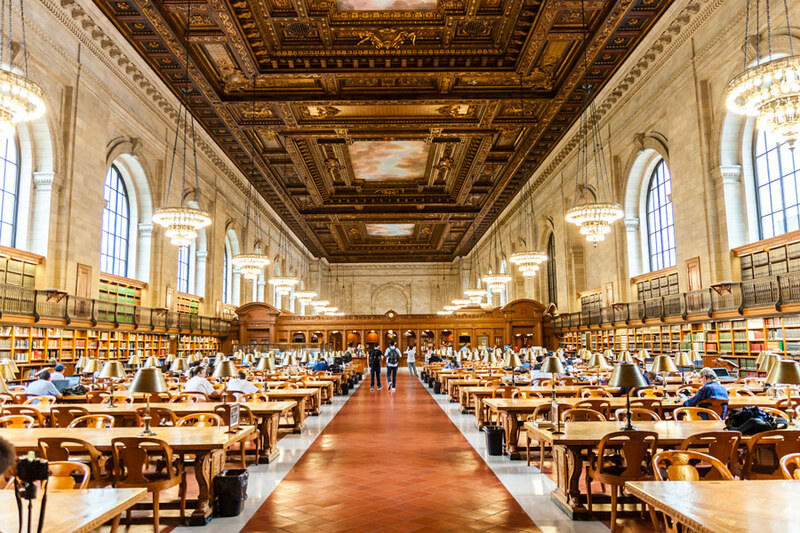 "There's another discussion here: our new understanding of the heroic language of public work. We are uncomfortable with it. The tension around that is important to think about: What means what to whom?" Commissioner Diane Chapin noted that ideas around how the perimeters of parks should look are always in flux, she was not convinced on the appropriateness of a more ornate fence. Her colleague Michael Goldblum asked if there were other options: Could the piers stay and the fences be lowered? Lower most of the pillars but leave the ones near the entrance intact? "It's within preservation ideology and philosophy to make some changes along the perimeter and not be [a] slave to every possible historic aspect," said LPC Chair Meenakshi Srinivasan, a statement with which Commissioner Frederick Bland agreed. Sybil Young, a Parks preservationist, requested approval from the Commission in light of the fact the project's funding remained undecided. Chair Meenakshi Srinivasan assented and the commission agreed it could approve the work, among other requested changes. If and when the Parks Department has the capital funding for the new fences, it can go back to the LPC for discussion. An LPC spokesperson said that if there is significant new information the commission may hold an additional public meeting. A Parks Department spokesperson said that right now, except for work at the two southern entrances, the agency does not have funding or LPC approval for a new southern border fence or money to reduce the height of the piers. The agency is not actively seeking funding for the southern border portion of the project.